Acting Defense Secretary Shanahan Investigated Over Ties To Boeing Patrick Shanahan spent 30 years as a Boeing executive before joining the Defense Department as deputy secretary. The inspector general will examine whether Shanahan improperly promoted Boeing. 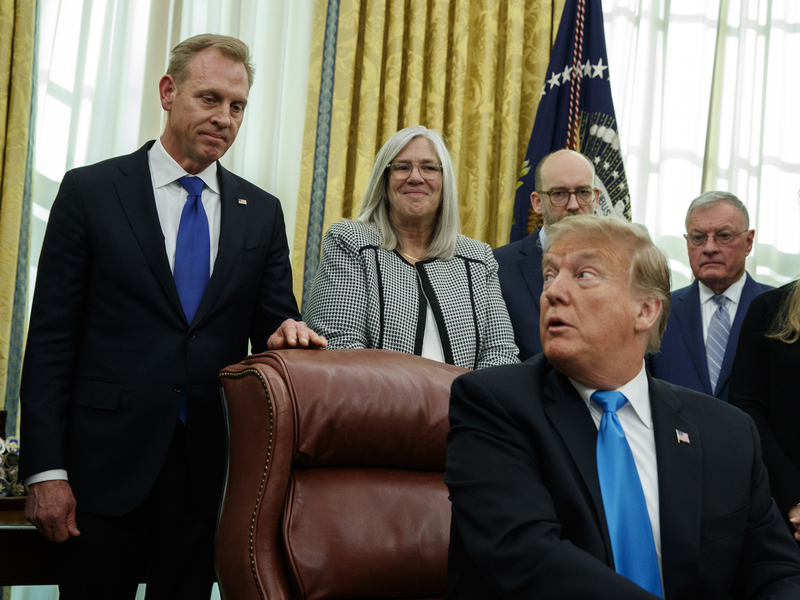 Acting Secretary of Defense Patrick Shanahan listens as President Trump speaks during a signing event for Space Policy Directive 4 in the Oval Office last month. Acting Defense Secretary Patrick Shanahan is under investigation by the Pentagon's Office of Inspector General because of allegations he improperly advocated on behalf of his former employer, Boeing Co.
Last week a Washington-based government watchdog group, Citizens for Responsibility and Ethics in Washington (CREW), filed a formal complaint with the IG, alleging Shanahan promoted Boeing over competitor Lockheed Martin in discussions with Pentagon staff. CREW also alleges that Shanahan pushed for increases in purchases of Boeing's F-15X jet fighter. Shanahan spent 30 years at Boeing, working on commercial and military aircraft and missile defense systems before President Trump chose him to be deputy defense secretary in 2017. Shanahan has served as acting secretary since Defense Secretary Jim Mattis' resignation late last year. At a Senate Armed Services Committee hearing last week, Connecticut Democratic Sen. Richard Blumenthal asked Shanahan whether he supported an investigation of the allegations. Shanahan answered that he did. CREW says it based its allegations on reporting that first appeared in Politico. Shanahan has said he has recused himself from all Boeing-related matters since joining the Pentagon. The investigation presents a stumbling block to Shanahan's possible nomination as permanent defense secretary. Shanahan is only the third person ever to serve in the role of acting secretary of defense and has been in that position longer than any other.